Dōmeki's grandfather and the Shinto priest of the shrine where Dōmeki now lives. He died sometime ago but he is always mentioned in Dōmeki's stories. The reason for his death hasn't been mentioned yet. 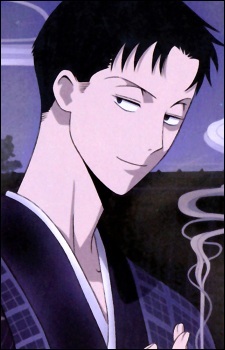 Haruka looks strikingly like Dōmeki, but he has a somewhat more cheerful and outgoing personality than his grandson. He seems to have taught Shizuka a lot of stories regarding folklore, mythology and shrine practices. He has also an immense library that now Dōmeki uses and keeps. As the priest of that shrine, he had the power to exorcise spirits and see them as well, an ability passed on to Dōmeki (although Dōmeki could not see spirits). His style of exorcising spirits, like Dōmeki, was shooting a bow and arrow made of chi. When Yūko saw the wards Haruka had made for the library she indicated that they were of high quality, attesting to his skill and knowledge of the occult. Volume 9 of the manga marks his first appearance: in a dream provided by the Yumenai's balloons, which were originally Haruka's. He acts like a guide to Watanuki as Yūko does, asking him why he really likes Himawari and pointing out that since he met Himawari, things have gone bad for him, as well as asking why he found Shizuka Dōmeki irritating. When Watanuki fell from the school window, he entered a dream-like state in his near death condition. It was Haruka who crossed into this dream-like state and brought Watanuki back to consciousness. Watanuki continues to see Haruka in his dreams. In chapter 127 Haruka has been shown to have the power to not only enter Watanuki's dreams, but can also bring him "across" to another person's dream. He acts as a guide to him as well in explaining things or warning him of danger like the time Kohane's mother splashed Watanuki with hot water. His statement that this is because all dreams are "connected" and thus it is possible to travel between dreams, is an idea that has been shown in other CLAMP works, notably in X. Haruka's ability to "cross" dreams and perhaps using them to sense certain knowledge is one that is characteristic of the yumemi from X.